It’s now a common refrain: We are living in dark times. So this morning, in doing my Morning Pages, a working ritual created by Julia Cameron that has one journal stream of consciousness for three pages before getting started with one’s work, I didn’t rush through, the way I’m prone to do. I could feel how raw I felt after the events in Pittsburgh on Saturday. Instead of writing out my usual b.s., my woes, my ‘oh I’m so tired’, or ‘oh the conflict I had with so-and-so’, I was writing about the state of the world, the state of America, which, as ever, has irrefutable impact on its little brother to the north. So I’m hurrying myself through my thoughts, eager to get started, get back to a short story I’m writing, a story that couldn’t be further from the events of our day, and I’m wondering about the value of what it means to even write stories at times like these. With an American president who attacks the free press on a daily basis, first calling it fake so many times we’ve lost count, to now calling for or at the very least praising violence perpetrated against journalists, it’s clear to any thinking person worried about where Trump’s taking us that the role of the journalist—the role of a free press—has never been more important. It’s worth noting that one of the first acts Hitler committed as the newly elected Chancellor of Germany in ‘33, was to shutdown the largest (Jewish-owned) publishing houses, including a daily Berlin paper, the Vossische Zeitung, that was liberal and of course anti-fascist and anti-Hitler. Perhaps the “liberal” press (that is to say the (Fox) press that isn’t bending over backwards to please the President) keep making these Hitler analogies for good reason. The paranoid conspiracies of the few become the terror of the many when the man in charge keeps stoking those fires. But what of the artist? When horror movies and Marvel fantasies dominate the box office, it’s hard not to see we’re going to story for the escape it can provide. But is that enough? Should it be? Mustn’t it be more than that? It was in asking myself this question that I googled ‘great fiction/stories written during the holocaust’. That mostly led only to stories written about The Holocaust. 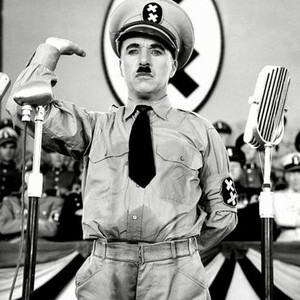 Then I came across the fact that Charlie Chaplin’s The Great Dictator, the most successful movie he ever made, was released in October 1940. The United States had yet to even wage war on Germany. And he told it good. Imagine if the world had listened sooner.